Not enough cuts there to wipe out about 70 buses (including white NABIs still around). That's a CNG and not going anywhere. Eldorkos couldn't help wipe those off the radar? As I indicated above, they sure could, as they could go over to NW and be reinstated on routes like 230, 234 and 696, and some 40 ft buses then get transferred to W.
Btw I did see #6224 at Harlem/Chicago but it was belching alot of black exhaust. Maybe that's what Pace used to justify its cover story about North. Add 6219 and 6258 to this list. http://pacebus.com/sub/news_events/public_hearings_upcoming.aspso that means 540 Farnsworth Avenue is no longer a Saturday service by April 2019? Did you forget to type your question? I said to that post that pace is having a 4 year budget, is 540 Farnsworth Avenue is no longer a Saturday service or is it still a Saturday service for April 2019? Between 1/1/19 and 4/1/19, 540 Farnsworth Ave will no longer have Saturday Service (read: discontinued) as it says in the post you quoted. Ohh I see because I remember there is not much people grabbing that bus. Exurban services always take a hit on Saturdays. The question is which routes perform worse than others; and at least there’s 533 service to cover the Walmart. Yea, 533 covers 540, I got some videos on YouTube that I record. 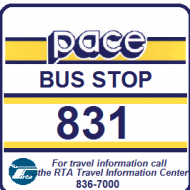 Passenger notices posted that 661, 809, and 824 are eliminated with last trip Jan 18. Having seen a 379 with a HERION/WHEELER via ORLAND SQ sign today, which you mentioned here, more likely to replace that terminal. Are you saying you think the new facility would be on Herion Street, rather than the mall property? I would think Pace would prefer to negotiate with the mall to come up with a more permanent solution. I'm sure that space can be made for a passenger facility in one of the mall's rarely used parking lots, most likely the southeast one. The current configuration shortens the layover time too much for buses to get back on schedule in many cases, so I think Pace would want to keep buses closer to the mall. Are you saying you think the new facility would be on Herion Street, rather than the mall property? That's the inference I got, or why would the setup be essentially the same as at Yorktown (bus stop at the mall, but layover at Branding/Finley)? Yorktown kicked the layover off mall property, and I assume similar happened here. Pace had to get an agreement with the new owner of Golf Mill to build the Pulse station there. All effective March 4th 2019. Posted on the website's main page, it looks like the four remaining bus routes will be eliminated after April 1. The Saturday service of the #504 will be eliminated April 6. But the Saturday service of the #209 Busse, and weekday only services of the #304 Cicero-LaGrange & #326 Irving Park is listed as "TBD in June".